At one time or another, we have all known the painstaking reality of weariness. Whether it be sleepless nights of infancy, tantrums of the toddler years, ups and downs of teenage days or even a heavy heart for adult children, weariness is an all too familiar feeling for moms of all stages. I want to share one of the most beautiful, powerful moments I’ve recently experienced with God as I have faced some of my hardest days as a mom. As my fingers tap across this keyboard, I am praying for every eye that skims this page, for each momma heart that reads this post. I pray God uses my experience, the revelation that He gave me to stir your heart to unrelenting, radical prayer. I am mom to two amazing boys, ages 10 and 14. I do not have to tell you that each phase and stage of mothering has its own set of challenges. As I am in the midst of the teenage years, I can easily convince myself that this must be the most difficult stage, yet I am reminded of those early days as well. No difficulty is minimal. No trouble is irrelevant. No burden is unimportant to your Heavenly Father. He sees and knows right where you are and He longs to meet you in that place. He cares for you (1 Peter 5:7). Back in December, I found myself in one of those rough patches. It wasn’t a new trial, but it seemed especially heavy. I was in a pit of despair and hopelessness, extremely weary from the fight. As part of my quiet time each morning, I was reading a few pages from a book about loving difficult people. (In case you didn’t know, teenagers can be difficult people and not always easy to love.) The Lord had clearly led me to this book as I cried out to Him to give me a Christ like love for my teenage son…especially on those really hard days. I sat down that morning after my Bible reading and prayer time and found myself reading the author’s account of difficulty in her marriage. She shared that the Lord, through her reading of the battle of Jericho, had called her to physically march around her home. As Joshua had been instructed to march around the city of Jericho, God was calling her to do this on behalf of her marriage. This was her Jericho. The moment I read it, I knew He was calling me to do the same for my son. Jericho was an impenetrable city protected by walls. In my life, my son was “walled off” by the lies of the enemy. I knew I had to rise up and pray them down. I must admit that I was hesitant. I did not immediately obey. I could not understand it, but I was afraid. Would He really ask me to do something so crazy? What if I did it and nothing happened? These thoughts echoed in my mind all throughout my day. The next morning, my youngest son pulled our ornament from the box to hang on the Jesse tree. We did this each morning before school as we anticipated the coming of Christmas. As he pulled the corresponding card, he began to read the account of Jericho. I sat frozen…absolutely stunned at what I was hearing. We were a day behind on our Jesse tree. Or so I thought. What we perceived as “a day late” was God’s perfect timing. After the verses were read, my son looked at me and said these words, “Mom, God blessed Joshua and did a miracle because he obeyed even when those people probably thought he was crazy.” I could barely contain the hot tears welling up in my eyes. I held him and assured him that his take away was absolutely correct. And I knew that I had to begin my march that day. 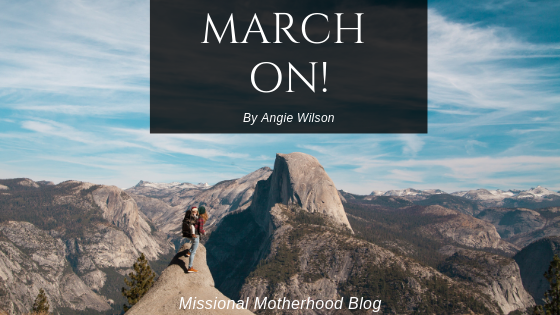 I began my march around my “Jericho”…first, my home and then coming inside and marching around the perimeter of my teenage son’s bedroom. As I walked around, I cried out to the Lord for those things weighing on my heart for our home and my son, in particular. Yes, it felt awkward in the beginning, but with each passing day, it became an incredible time of prayer and worship. Some days were cold, some were rainy. I marched anyway. I knew I was obeying the call of the Lord. On day 7, I marched seven times around my entire home and my son’s bedroom. I wish I could adequately describe this experience. It was one of the most powerful, intimate moments with Jesus that I’ve ever known. As I closed out my prayer time on this 7th day, I asked the Lord to reveal anything to me that I needed to see as my son’s mother. I asked Him to reveal any darkness or secret that was plaguing my son. Three days later, my son called me into his room late at night. He invited me to sit on the edge of his bed and he began by saying, “I need to tell you something. I’ve tried keeping this a secret for a couple weeks, but it is eating me up inside and I cannot lie anymore.” He began sharing the details of what he’d been hiding. Never, in his flesh, would he have openly divulged details of a sin. Never had he confessed prior to getting caught. Joshua 6:8 says, “And it was so.” The walls of Jericho were coming down! As I sat and listened, my heart was absolutely riveted with gratitude. The Holy Spirit flooded me with compassion, mercy and grace for this dear child. Several weeks later, I began a Bible study at my church. Week 2, day 5 of this study opens with this…”Today we are looking at another Old Testament story as we continue our study in spiritual warfare, this one found in the book of Joshua.” The study continued on to have us recount the story of Joshua and Jericho. God was confirming what He had called me to do. He was also calling me to continue. This is what I heard the Spirit saying to me. Yes, my initial march had proven the faithfulness of my God. However, there was still much work to be done. He did not want me to stand still and be satisfied with what He had begun. A couple weeks later, the Lord once again laid on my heart to continue praying for this child in a powerful way. He gave me a specific prayer to pray over him. Part of that was to anoint his bedroom doorpost with oil and march around the perimeter of his room once again as I cried out for victory in his life. The Lord reminded me that the devil cannot stay where the name of Jesus is being proclaimed. If I submit to God and resist the devil, he has to flee (James 4:7). As I finished my prayer time, I tuned his radio to play Christian music throughout the day while he was gone. Even when I left the room, the truths of Scripture were being proclaimed in that room, piercing the darkness and banishing the enemy from that place. Are you physically tired and weary from this holy occupation of mothering? Are you emotionally drained from being all things to all people? Are you spiritually dry and weak, feeling as if you’ve got nothing to offer? Are you facing trials of every kind with your child, fighting to resist the lie that this “thing” will never change? Have you been praying for something for weeks, months or even years? Find a truth in Scripture to stand on. Pray relentlessly. However the Lord leads you, march on. Your march may not look exactly like mine (although I encourage you to consider it), but He does desire your heart to be in a constant state of desperation…desperation to be with Him and to hear from Him. Angie, Thank you so much for sharing how the Lord led you to intercede for your son! I needed this encouragement as I pray for my son. The Lord showed you sweet insight. I am grateful that you have passed this on to us.